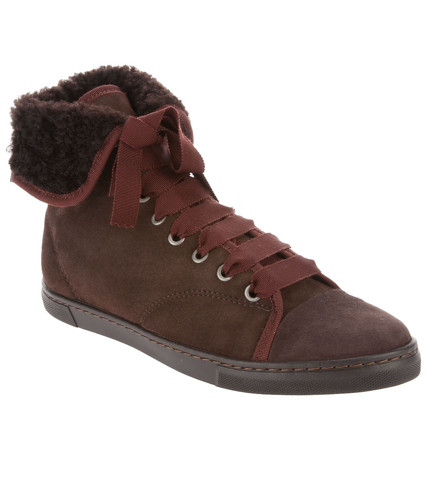 Dark brown shearling high top sneakers from Lanvin featuring a round toe, a burgundy grosgrain ribbon lace-up front with 14 eyelets and a foldover top. Grey leather pumps from Lanvin featuring a round toe, elasticated, with crystal embellished black flower on the front and leather sole. 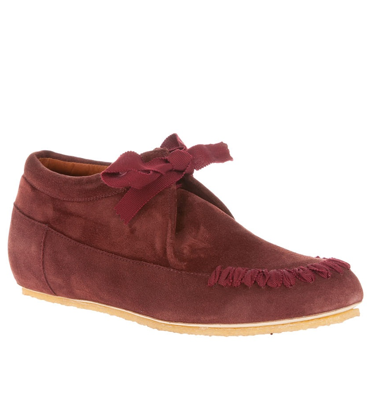 Red suede moccasin style shoe from Lanvin featuring a ribbon tie closure, ribbon woven front, rounded toe and a rubber sole. 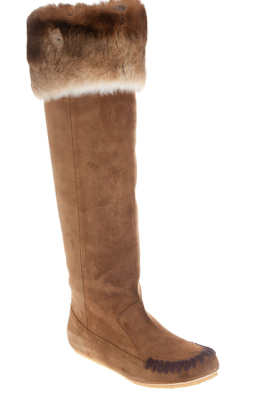 Brown suede and rabbit fur long boots from Lanvin featuring a round toe with darker brown stitching on the top and a thick rabbit fur trim at the top of the boot. The boots simply pull on.